Santa Cruz is known for being quirky and off-beat. 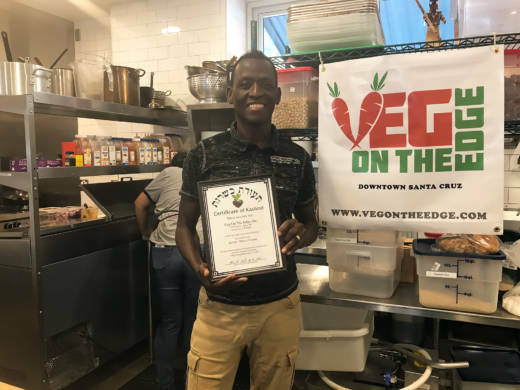 So perhaps it’s only fitting that it is home to what is most likely the only vegan, gluten-free and kosher West African restaurant in the world. 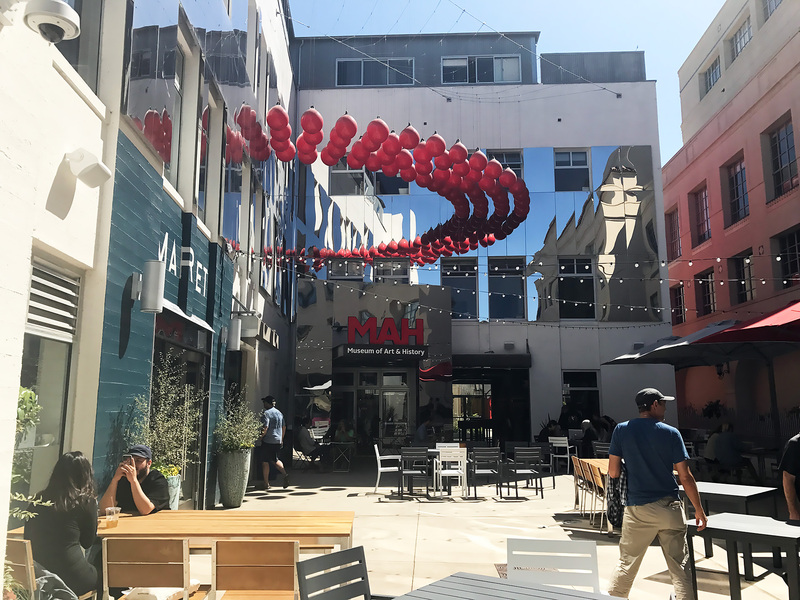 Called Veg On the Edge, it's located in a new food court called Abbott Square, that's in the heart of downtown in this beach city of 65,000, adjacent to the Santa Cruz Museum of Art & History. Its owner, Akindele Bankole, is of Nigerian descent, of the Yoruba people specifically, and grew up in both Nigeria and Germany, the son of two doctors. Living in Germany, he became interested in Judaism, and much later, converted, which is why he took on the extra work and expense of kosher certification. It’s the only kosher restaurant in a city that hasn’t had one in around 20 years, and even when it did, it was just a Noah’s Bagel’s franchise. 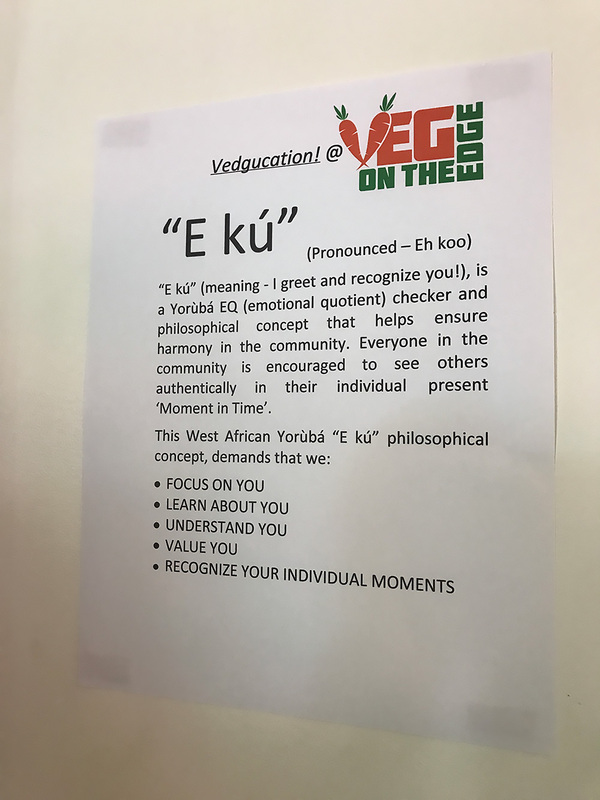 A Yoruba greeting is posted on the wall, “E kú,” which means “I greet and recognize you” but it’s also a philosophical concept that “helps ensure harmony in the community,” says Bankole. He has it posted to show his customers that his intention is for them to feel they are not only fed well, but are valued, recognized and honored. While in college and for many years beyond, he worked in a managerial position at McDonald’s and then as a business consultant. A few years ago, motivated by changes in own diet, he began to kick around the idea of opening up a juice bar. That morphed into a vegetarian restaurant or café, but of course, Santa Cruz had the vegetarian market already well-covered. African food seemed to spark people’s interest in a way that other ideas he had thought of did not. Though Bankole said he liked to bake cakes for people as a youngster he is not a chef himself. So he hired a local chef, Jonathan Miller, to develop recipes for the dishes he grew up with – minus the meat, though there are some other non-African items as well. Suya, grilled meat on a stick in Africa, is made here with shiitake mushrooms instead. They are dusted in a spice mix that is heavy on black pepper, spices and ground peanuts. 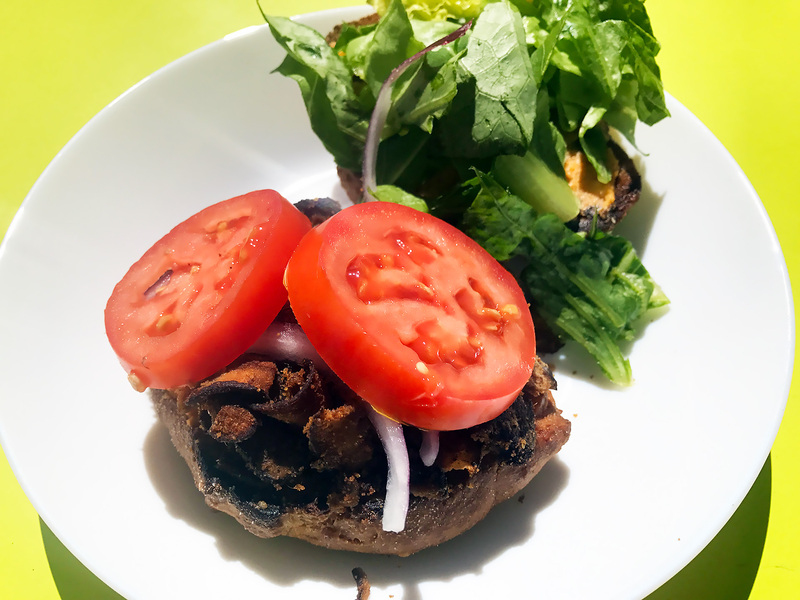 The suya is a key ingredient to several dishes on the menu, including the burger, in which the shiitake mushroom suya is the stand-in for the burger itself with a thin layer of house-made cashew cheese, tomato slice and lettuce leaf on an artisanal gluten-free bun. Moin moin is an interesting stand-in for tofu, though it’s made from mashed black-eyed peas. 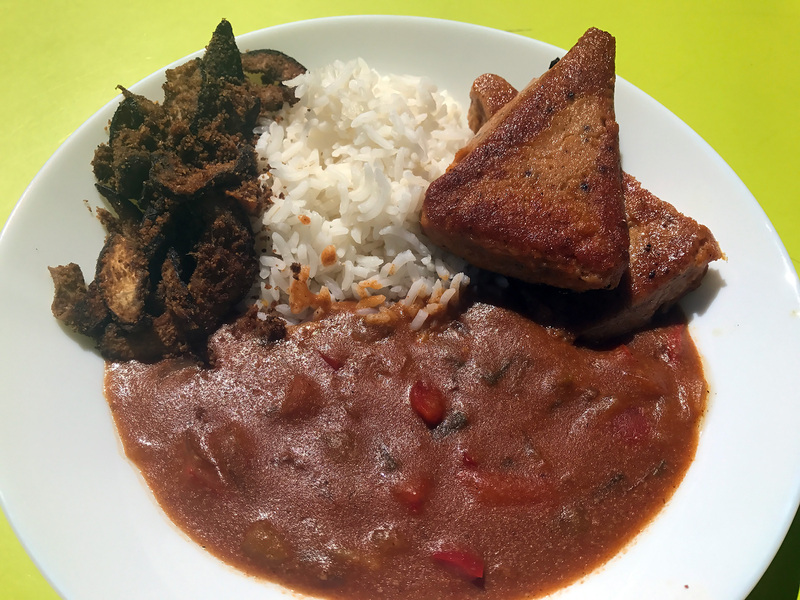 Noting that it’s kind of like tamales in consistency, Bankole said the puree of black-eyed peas is infused with a caramelized onion and tomato sauce that’s been reduced to lose the acidity of the tomato. “Even someone who has acid reflux can have it,” said Bankole, adding that in Nigeria, the puree is shaped and then put into a banana leaf and then steamed. Here, he uses a mold to hold it together. 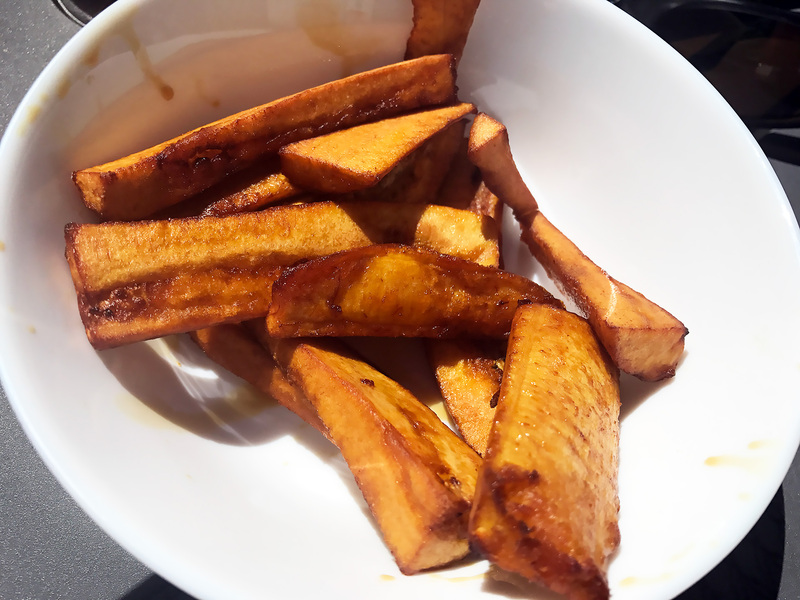 There are also sides like potato balls, in which mashed potatoes are held together with chick pea flour, and plantain fries. 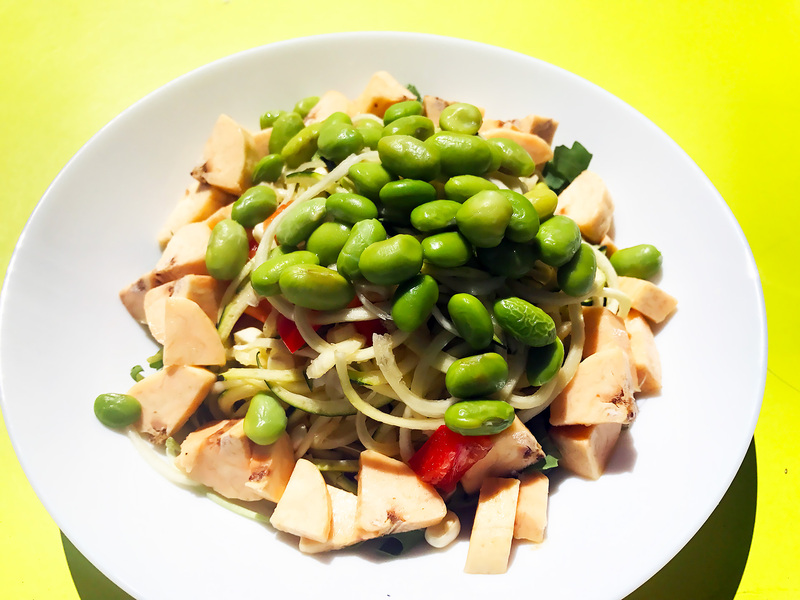 There is also a raw plantain salad with zucchini “noodles,” and other vegetables. 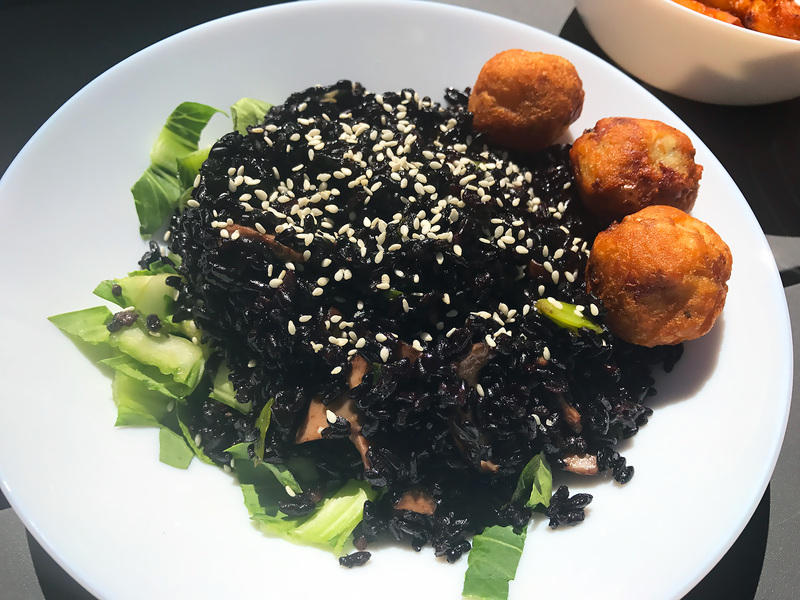 One of the most popular non-African items on the menu is a rice bowl with black rice, mushrooms, bok choy and scallions, a decidedly Asian treatment but flavorful nonetheless. There is also tofu and tempeh as add-ons, but no fake meat. Much of the produce is organic and comes from local farms. There are also fresh juices and a separate breakfast menu on weekends, with the plantain waffle proving to be exceptionally popular. The restaurant has been embraced by vegan and gluten-free meet-up groups in the area, kosher visitors who happen to be driving through who find Veg on the Edge via Google, and others looking for something unusual to try. Going out of his way to serve all of these disparate diets might make some restauranteurs crazy, but despite the hard work, Bankole thinks it’s paying off. Hours: Open daily from Mon-Thu, 11am-9pm; Fri, 11am-10pm; Sat, 9am-10pm and Sun, 9am-9pm. Price Range $ entrees averaging around $9.